Researchers present a method that uses combinatorial antibody libraries to endow cells with new binding energy landscapes to regulate their phenotypes. The literature is replete with examples of highly potent and specific antibodies derived through the processes of phage display, in vitro maturation, and protein engineering. 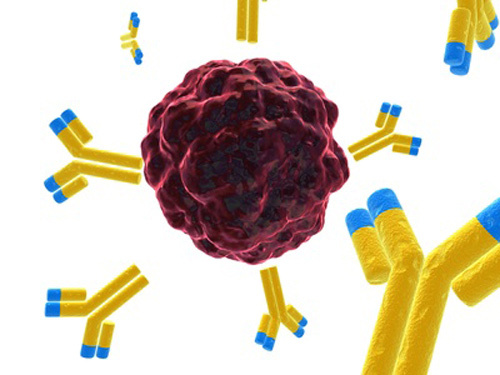 While development of high-affinity binders is becoming relatively routine, there are practically no methods to discover and improve antibodies that carry out relatively complex biological functions that extend beyond direct binding of an epitope: for example, catalytic antibodies exhibiting enzyme-like turnover and catalytic constants have been notoriously difficult to obtain; likewise, obtaining antibodies that act as receptor agonists, through complex set of interactions, has been very difficult. The primary reason for these difficulties has been that the steps of affinity selection and maturation have often been separated from the screening for biological function, the latter requiring the use of biology-specific mammalian model system. Zhang and colleagues* present an elegant solution to the bottleneck by designing a combinatorial antibody library in lentivirus (Figure): after infection, multiple antibodies are expressed within each mammalian cell and are also secreted, allowing for multidimensional assessment of interactions and biological effects. Because more than one virus can infect a single cell, the initial diversity of the antibody population attained at the phage display level is retained and even enhanced upon the step of lenti infection and functional selection because of the possibility for further combinatorial associations of heavy and light chains derived from different antibody clones. In the example presented, the authors select directly for antibodies that operate as phenocopies of erythropoietin working through its receptor (EpoR). Phage displaying the initial combinatorial antibody library were enriched for EpoR binding through solution panning. The enriched pool was used to isolate the antibody genes and transfer them to lentivirus, which in turn were used to infect TF-1 cells overexpressing wild-type EpoR. The team was able to select directly high-quality agonist antibodies from cells expressing more than one antibody, with several distinct clones possessing high efficiency and acting through slightly different epitopes. The overall methodology presented in this work should be easy to adopt by others because it derives from readily available phage libraries and lentiviral vectors. Figure. Scheme for selection of antibody agonists from combinatorial libraries. Antibodies that bound EpoR were selected from a combinatorial antibody library displayed in phage by affinity-based selection. The antibody genes from the selected phage were cloned into lentiviral vectors to allow phenotypic selections after infection of eukaryotic cells and integration of the antibody genes into the genome. The transduced cells were plated in methylcellulose agar such that the secreted antibodies were trapped around the cells producing them. The colonies that formed were harvested using a micromanipulator, and the antibody genes were recovered by PCR. The PCR products were cloned and sequenced, and the respective antibodies or antibody combinations were tested for their activity. The active antibodies were expressed in mammalian cells and purified for further characterization. PCR, polymerase chain reaction. A method is presented that uses combinatorial antibody libraries to endow cells with new binding energy landscapes for the purpose of regulating their phenotypes. Antibodies that are expressed in cells infected with a lentiviral combinatorial antibody library are selected directly for function rather than only for binding. The potential diversity space can be very large because more than one lentivirus can infect a single cell. Thus, the initial combinatorial diversity of ~1.0 × 1011 members generated by the random association of antibody heavy and light chains is greatly increased by the reassortment of the antibody Fv domains themselves inside cells. The power of the system is illustrated by its ability to select unusual antibodies. Here, the selected antibodies are potent erythropoietin agonists whose ontogeny depends on recombination at the protein level of pairs of antibodies expressed in the same cell to generate heterodimeric bispecific antibodies. The obligate synergy between the different binding specificities of the antibody’s monomeric subunits appears to replicate the asymmetric binding mechanism of authentic erythropoietin. ASSAY & Drug Development Technologies, published by Mary Ann Liebert, Inc., offers a unique combination of original research and reports on the techniques and tools being used in cutting-edge drug development. The journal includes a “Literature Search and Review” column that identifies published papers of note and discusses their importance. GEN presents here one article that was analyzed in the “Literature Search and Review” column, a paper published in Proceedings of the National Academy of Sciences USA titled “Selection of antibodies that regulate phenotype from intracellular combinatorial antibody libraries.” Authors of the paper are Zhang H, Wilson IA, and Lerner RA.